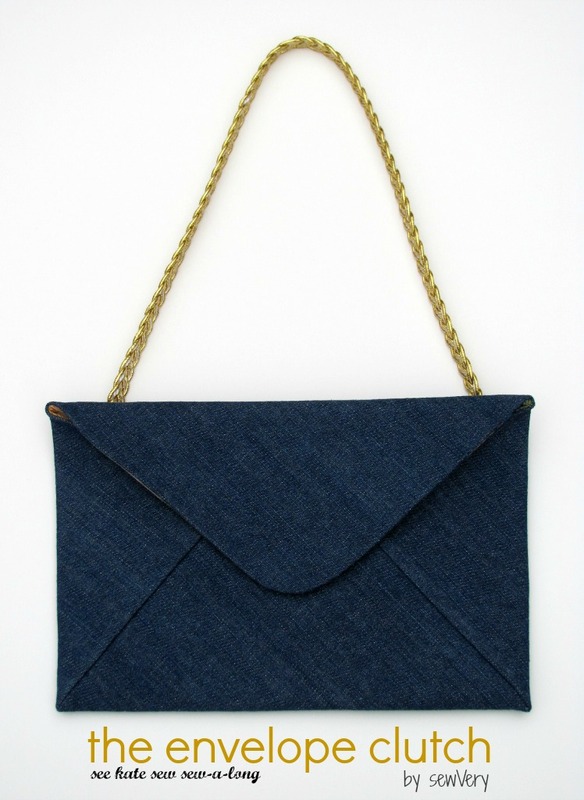 Have you signed up the See Kate Sew's Envelope Clutch Sew-a-Long yet? Better hurry. After you sign up for the sew-a-long, you can find the free pattern here on Kate's blog. I was a little hesitant to sign up at first thinking that I wouldn't have enough time to put a clutch together, but this bag super quick and easy to make! Love it when a project is like that! Don't you? To make my Envelope Clutch, I used some fabric I had on hand. The outer fabric is a heavy cotton denim that was a remnant from a pair of jeans I made my daughter a couple of months ago. I fused decor bond to the back of it to help the bag maintain its shape. 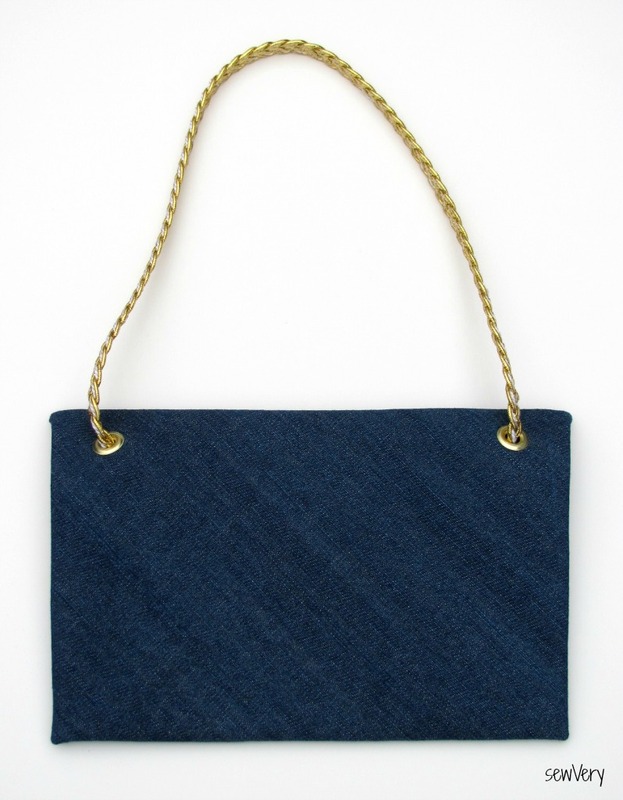 The way I cut out the bag, the grain of the denim is on the diagonal and gives the finished clutch a little more visual interest. The interior is a premium quality quilting cotton remnant I picked up at Joann's a while back. Sorry I don't have the official name, but I think they still sell it. (Update: The fabric is a Keepsake Calico print called A Fuji Afternoon Umbrellas) I fused regular light weight interfacing to the back of the lining for a little extra support. I find the colors and the umbrella pattern to be warm and fun, and it was a nice departure for me to use the print on the interior of the bag and the solid on the outside. Here are some other purses and bags that I've made--Teardrop Bag, Steph in the City Bag, Emmaline Bag, Patchwork Purse, Charm School Handbag, and these three Sweet Pea Totes (1, 2, and 3). For my Envelope Clutch, I did change up a couple of the details. First, I used a magnetic snap in lieu of a button closure. I avoid making buttonholes at all costs unless it is absolutely necessary! However, the first time I put the bottom snap on, I measured incorrectly and had it placed way too high! When I moved the snap down into the correct position, I was left with two small holes to cover up on the exterior--hence the sewVery label strategically placed! Second, I'm really not a clutch kind of gal. When I am out and about, I need both hands free in order to grab things at the store or to hold hands with my kids. 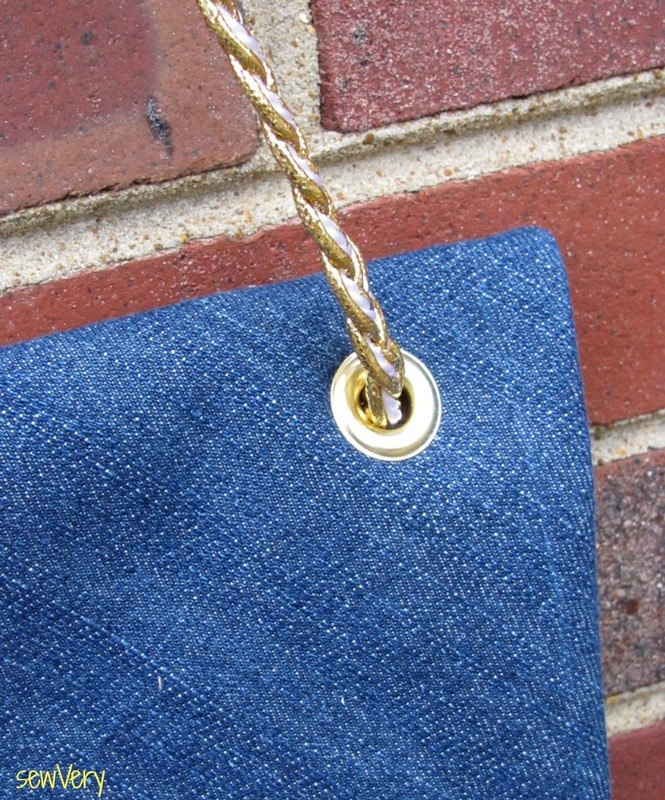 So, I added a gold metallic braided trim to the clutch as a purse strap. To do this, I installed two large gold grommets on the back roughly 1" down from where the top folds over. I ran the trim through the holes to the inside, zigzagged the ends individually and then seared them with a lighter before overlapping them and stitching them together again. I'm very pleased with how the strap looks from the outside, but how the two pieces are connected on the inside looks real rough! After consulting with some friends, I think I've decided to make a little fabric sleeve out of the lining fabric to wrap around the connection. I just didn't get around to it before I took these pictures and wrote up this post! Well, that's it! Pretty simple even with my two slight modifications. I've already added my photos to Kate's Envelope Clutch Sew-a-Long Flickr group. Have you? Sorry I haven't shared my matching Teardrop Bag Zipper Pouch and Tissue Holder with you until now. I've been very busy these last few days preparing items for a consignment sale, taking care of a sick little boy, cleaning house, and working on my new blog design. Whew! But I'm here today to show you the zipper pouch and tissue holder I made to go with my Teardrop Bag. These two items were very simple to make. I used Simplicity 9949 Bag E to make both; however, I chose to line the zipper pouch (which the pattern does not do). Nothing fancy here. Just pretty plan and simple. I like the size of this zipper pouch--the finished size is 5" x 8"--and I opted to add a loop and button closure to the tissue holder just for fun. Again, I used Joel Dewberry's Aviary 2 Bloom in Granite and Ironwork in Granite for the exterior and canvas duck cloth for the lining. Love these fabrics! Love them so much that I think I'll make another pouch or two out of it for the Make Because She's Worth It Campaign. If you haven't heard about this already, it's an effort among the sewing/crafting community to help stop human trafficking and slavery of women and girls. Other bloggers and readers are combining forces to Make zipper pouches and bracelets to give to those women and girls who are rehabilitating from sexual slavery. I hope you'll consider joining this worthy effort. If so, please visit The Train to Crazy or the She's Worth It websites for more information. My super talented friend, Heather from The Sewing Loft, asked me to test out a new machine stitched embroidery design she developed--Dangerous with Scissors! It took only 20 minutes to stitch up on my Brother PE770 embroidery machine and another 30 to 40 minutes to make this sewing bag. What a super cute quick project! And I needed a little bag just like this to carry some sewing to work on while I wait for my daughter at dance lessons! If you'd like to snag this fun embroidery design for yourself, head over to The Sewing Loft where Heather is generously offering the file for free when you subscribe to her newsletter! To make my bag, I cut out two pieces of canvas fabric that were roughly 12" wide by 18" long. Since this fabric is already very thick, I only used a piece of tear away stabilizer as backing for the embroidered side. After stitching out the design, I sewed the canvas pieces together to make the simple bag then inserted the gussets at the top for the handles. I had thought I would buy some rope to use for the handles, but at the last minute I decided to just use some fabrics I had on hand that had lots of purple in them which matched the thread I used for the Dangerous with Scissors design. I cut out three 1" strips of fabric the width of the fabric (roughly 42") and then braided them together. Slip the ends through the gussets and tie them off with a sturdy knot. These handles ended up being just the right length for me in case I want to carry the bag on my shoulder. This cute Dangerous with Scissors embroidery design would also be ideal for use on a zipper pouch, apron, pillow, or t-shirt for a sewer or a hair stylist. And don't forget, Heather's offering the design file for free when you subscribe to her newsletter at The Sewing Loft. After days of sewing and multiple roadblocks, I have finally finished my Teardrop Bag! I bought this pattern months ago from my friend, Janelle, at Emmaline Bags and Patterns. I have really enjoyed using her patterns, and I can now say I have completed the Emmaline Bags and Patterns trifecta--The Emmaline Bag, The Steph in the City Bag, and now The Teardrop Bag! I feel like I deserve a really big prize, especially after conquering this last one. As you know, not all projects go smoothly from start to finish. In fact, most of mine rarely (if ever) are done without some sort of issue (whether it's human error or machine error), but my Teardrop Bag endeavor had more than its fair share of challenges. First, I printed out the pattern months ago when I purchased it. I read through the instructions on my computer then, too, but opted to not print them out. No big deal. I do that all the time to save paper, ink, and space. However, I can only guess that I failed to check the scale of the pieces I had printed out and taped together. I discovered this error only after I had cut out all the lining pieces and the rectangle pieces of fabric used to cut out the outer bag. My pattern pieces were 3/4" shorter in width than the fabric! What I then learned is that when printing out pdf patterns on my HP Deskjet 1050 printer, I have to use an A4 paper size instead of Letter and make sure that I check the actual size option. I've been having issues with pattern printing for a while now in the form of some lines being cropped from the print area (but the pieces are normally to scale). I have no idea why I suddenly thought to try printing them out on A4 paper, but it seems to have solved all those printing problems! Yay! Ok. So back to the issue at hand. Since I had already cut out several pieces using the scaled down pattern version, I had to run with it, which ended up being just fine because this bag is huge! Now I've finished cutting out all my pieces, and I go to the ironing board to starting fusing the fusible fleece to the outer bag when I discover that my fabric has faded spots all over it on one panel. I then inspect the left over fabric more carefully and realize that roughly 1 1/4 yards out of the 2 yards of the Joel Dewberry Aviary 2 Bloom Granite fabric I ordered online was flawed! Luckily, there was enough undamaged fabric to cut out duplicate pieces of the ones that I had to replace. Ugh! Next hurdle was deciphering the pattern instructions. 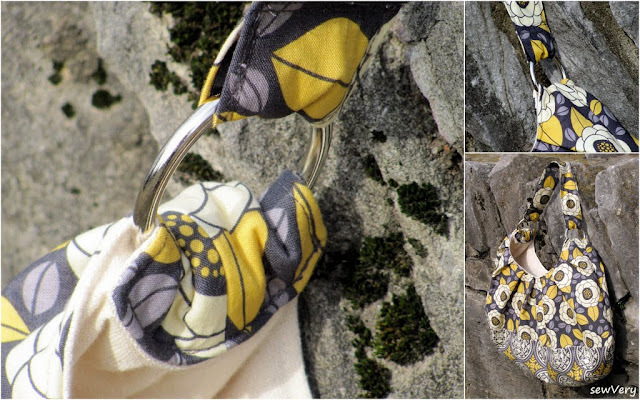 You see, I opted to make my Teardrop Bag with both the optional gusseted zipper opening and the o-ring handle mounts--both of which were additions to the original pattern instructions. Because of this, you have to skip some of the original steps and jump to a different page here and there. With two children constantly running around and interrupting me, it's a wonder I got this bag finished at all! I'm glad I made a gusseted zipper opening since I never have, and Janelle's written instructions and photographs made understanding each step of the process very clear. However, I'm not sure I really like the gusseted zipper opening on this bag after all. I thought it would be nice to have since the opening of the bag is so large, but I find it somewhat awkward to zip and unzip. It actually requires both hands which sometimes can be a bother. At first, I goofed up and sewed the zipper in wrong for the inner pocket. I was distracted by my children, (so they get the blame for this, too!) but I picked it out and fixed it. I learned how to sew a zipper pocket from Janelle's tutorial that is included with all her patterns. It's really a great tutorial! I also added a slip pocket to store my phone and tin of mints. No problems with this step! Whew! But I wish I had sewn it in a little lower. The gusset zipper gets in the way of the top of the slip pocket. I used a lot of pins to secure the outer bag to the lining before sewing them together. Because I used canvas fabric for the lining, the overall bag was rather stiff and at times a challenge to maneuver under my sewing foot. I have never been poked by pins as much as when I was sewing the outer bag to the lining! All was going well on the third and final day of bag construction when I had to use the seam ripper to remove one stray stitch where I had sewn on the o-rings. I guess I don't know my own strength, because I pushed the seam ripper so hard that it slipped and sliced open the top of my left hand index finger. It began to bleed immediately, and I thought I would faint! I can't stand the sight of my own blood. I'm not so sure I agree with Janelle's difficulty rating for the Teardrop Bag. She has it listed as Easy -- For Advanced Beginners. Now, like I said earlier, I've made all three of her bags, and the other two were listed as Intermediate to Advanced which I agree with her on that. But with the gusset zipper and o-ring handle options that I chose to tackle, I believe that the Teardrop Bag rating is most definitely an Intermediate to Advanced bag. Without those options, then I would agree with her rating. Would that distinction on her pattern have deterred me from tackling the exact same bag I made? Most definitely not! Overall, I'm very excited about this bag and have really enjoyed using it the past several days. The exterior fabric is gorgeous, and I really love how nice the bag looks with the way I pieced the coordinating fabrics together. This is the first time I have ever used canvas as the lining of a bag, and although it was a little challenging at times to sew, I'll use it again. I like how it makes the bag have more structure without using interfacing. In fact, the only other thing I used was some fusible fleece on the back side of the outer fabric in order to give it a little more strength. So, there you have it! That all said, this is one whopper of a bag! I'd say it's the biggest I've ever made. Even bigger than this Sweet Pea Tote I made last year! Although I made my bag slightly smaller than the regular sized version (due to my printing error), Janelle's pattern offers you an option to make it even bigger! I think she refers to it as the XL size! It's so much larger than what I would normally carry that I made up a matching zipper pouch to keep small items neat and tidy inside the larger Teardrop Bag. I also threw together a matching tissue holder. Since this post is now way too long, I'll share more about them another day. Oh, and the bag matches the Commuter Cowl I made, too. Ella took this picture of me--not bad considering she's not even 4 yet! 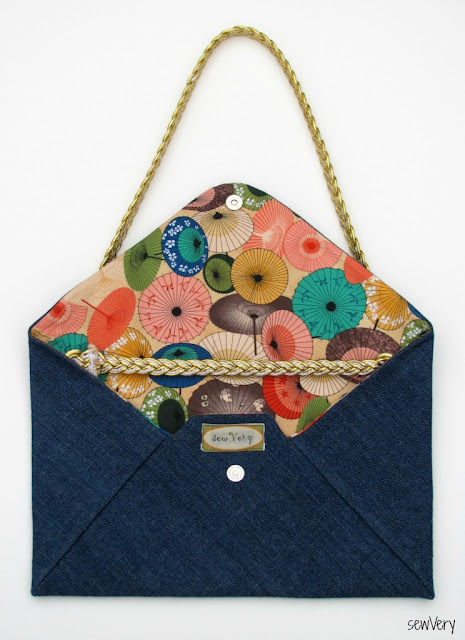 This bag has been featured at these fun parties! Thank you! I recently purchased the Sew Fab e-pattern bundle, and one of the first things I made was a Ruby Lou doll for my daughter. The Ruby Lou Doll pattern is by Sew Much Ado and is one of 18 patterns included in the sale (read below how to purchase it along with 17 other patterns). The pattern was so easy to follow because of the well written instructions and all the information included on the pattern pieces themselves. I wanted my version to be as cute as the one on the pattern cover, so I laid out several fabric combinations and let Ella choose her favorite. She picked out fabrics from Anna Marie Horner. The body of the doll is Clippings in Cherry while the sleeves and one side of the skirt are Buoyancy in Butterberry. The collar and leggings are Hugs and Kisses in Lime while the reverse side of the skirt is Triflora in Lipstick. I didn't have any wool felt on hand at the time, so I just used craft felt for the shoes and hair. I did check on wool felt at the store after I finished the doll, but it is very pricey even for the wool blended variety. The craft felt seems to be holding up just fine. To my surprise, when I gave the Ruby Lou doll to my daughter, my son was disappointed that I didn't make one for him. He's 8 years old, and although he loves stuffed animals still, I had no idea he would have wanted a doll. I immediately offered up to make him a boy version. But here's the thing--the Sew Much Ado Ruby Lou Doll pattern only comes with a girl version of the doll! No problem! To make the boy version, I simply left off the strands of hair, skirt, the cutouts on the shoes, and eyelashes. I then drafted a quick jeans pattern and whipped up a pair. I also drafted a pattern piece to make a hood for the doll's shirt and cut out a couple of extra pieces of fabric to make a kangaroo style pocket on the front of the shirt. When he's not wearing his jeans, he has on pj's (according to my son). What I ended up with was this adorable boy doll that made my son's face light up (and my heart melt). My son named him Lou. Oh, and I forgot to mention. Ella named her doll, Bella! Meet the newest members of our family! I've been wearing my new Commuter Cowl as often as possible over the last couple of weeks! It's a super, simple project that took me less than an hour to put together. The pattern for the Commuter Cowl is by Luvinthemommyhood, and it's one of the 18 patterns included in the Sew Fab e-pattern bundle that's on sale now through Feb. 11th. I used fabric from my favorite designer, Joel Dewberry. One side of the cowl is Aviary 2 Bloom in Granite and the other side is Aviary 2 Ironwork in Granite. I also made a matching bag that I'll share with you later next week (there's a sneak peak of it in the picture above), so be sure to come back for a visit then. If you don't want to miss that post, be sure to sign up as a follower through GFC or email, and you can always Like sewVery on FB, too! Thanks for stopping by, and please do check out the pattern bundle through my site. There's a great variety of projects, and you just can't beat the price for that many patterns! There's a huge giveaway with the pattern sale, too, so be sure to enter! Oh, and I have to give credit to my daughter for taking these pictures. Not bad for an almost 4 year old! 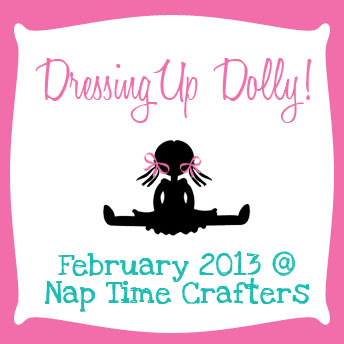 Do you know a doll that is in need of a special outfit for Valentine's Day? Then you're in luck! Today, I'm visiting with Amy of Nap Time Crafters where I'm sharing a tutorial on how to make your dolly her very own Valentine's Day skirt, bag, and shirt! Head on over to read the step-by-step tutorial and to check out some other amazing doll clothes being shared in the Dressing Up Dolly Series going on all this month! Another Sweetheart Dress with Extras! As promised, I made a second Sweetheart Dress using Luvinthemommyhood's terrific Sweetheart Dress pattern! To see the first fun, playful Sweetheart Dress I made, click here. Before I actually made the first dress, I had the idea to monogram the bodice, but I didn't have any yardage of solid cotton on hand. It took me a few days to make it to the fabric store to pick some up, and I just love how this turned out! This style of bodice is just perfect for embroidering either a monogram or a fun design. Since the bodice is fully lined, I used my Brother PE770 embroidery machine to stitch out the monogram on the outer bodice piece before I sewed the top of the dress together. I chose to go with a monochromatic look by using a thread the same color as the dress. For the back closure, I opted to use two hooks instead of a button. I really like the look of the heart with this type of closure, plus it was faster for me to sew than the hand sewn loop I did with the first dress! I was much more careful with the finishing touches of this dress. For instance, I made sure I did a neater job of topstitching the bodice down to the skirt. When we were at the store picking out the solid pink fabric for the dress, Ella spotted this cute pink netting type fabric that has small hearts all over it. It was like it was meant to be! I immediately thought about adding this to the skirt of this version of the Sweetheart Dress, but after getting home with the fabric, I began to worry that it might not hold up as long as the rest of the dress. Instead of making the netting a permanent part of the dress, I opted to make it a separate skirt (similar to an apron) that maybe she can wear with something else in the future. To make the heart skirt, I cut out the fabric the same width as and then a few inches longer than the skirt of the main dress. Fold over and hem the raw edges (if you want to, but it's not necessary with this type of netting material) and then gather the top of the skirt to match the skirt of the dress. I then cut out two pieces of the cotton fabric that were 4" long x the width of the fabric. I sewed them together so that the seams were on the sides and would match up with the side seams of the dress. I then ironed the sash like when you make double folded bias tape (so that both raw edges are encased). Insert the gathered edge of the heart skirt into the folded sash, pin like crazy, and then starting at one of end of the sash, sew the sash closed and the heart skirt all at once using a 1/8" seam allowance. The next "extra" I decided to add was the jacket. Since it's still pretty cool/cold here, and Ella doesn't have a cardigan sweater that would work with this outfit, I made this sweet, simple jacket to go with her second Sweetheart Dress. To make the jacket, I used Simplicity pattern 2270. I've had this pattern for a while but had never taken the time to try it out. It was very simple to make, and I mostly followed the pattern instructions. I think the only thing I did differently was sew the sleeves on to the bodice pieces first and then sew the side seam of the sleeve and bodice all at once. I used the size 5T for the jacket just like I did for the Sweetheart Dress. I think this jacket looks like it was meant for this dress! And since I still had plenty of both fabrics, I whipped together this simple little bag because special outfits need a special bag--right?! The jacket pattern (Simplicity 2270) comes with the pattern pieces and instructions for making this bag. However, I did add the heart skirt to the bag as an afterthought, and I constructed it the same way I did the heart skirt for the dress with one exception--the bag skirt is not removable. It is sewn on to the bag permanently. There you have it! My dressed up version of the Sweetheart Dress with a few extras thrown in for fun! Now Ella is all dressed up and ready for Valentine's Day! She is definitely my sweetheart! Also, check out my latest pattern purchases. You can read all about them and buy them for your own here. I'll be showing you later this week a couple of items I've already made from these patterns. One is the Commuter Cowl, another great pattern from Luvinthemommyhood. Thanks for stopping by for a visit! Please sign up to follow the blog by GFC, email or by liking my Facebook page. See you again real soon! Have a great day! 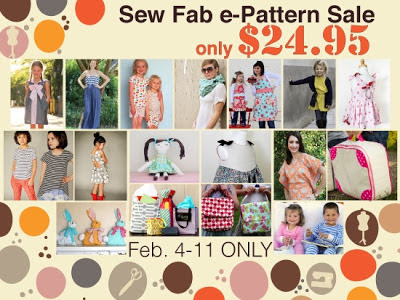 Sew Fab e-Pattern Sale Starts Now!